On the site of a long-shuttered naval air station, a home developer and General Electric plan a community with embedded smart technology in its energy, water, lighting and transportation systems. WEYMOUTH, Mass. — Kyle Corkum imagines a “smart city” with futuristic amenities like driverless shuttle services, heated sidewalks and a super-resilient energy grid that keeps humming through the harshest of storms. As chief executive of LStar Ventures, a developer of planned communities, he has a chance to build the neighborhood of his dreams from the ground up on the site of a long-shuttered naval air station in this town just 12 miles south of Boston’s booming technology hub. LStar, based in Raleigh, North Carolina, has enlisted General Electric as its partner. Because they are starting from scratch, Corkum said, the companies can embed smart technology into the energy, water, lighting and transportation systems that will serve the community. The project comes at a time when the tech industry is under intense scrutiny. Facebook is struggling with revelations that Cambridge Analytica, a political-data firm, improperly harvested private information from 50 million of the social network’s users. And Uber’s travails include a pedestrian death caused by one of its autonomous vehicles last month. Still, LStar is pushing ahead with the smart city, called Union Point. 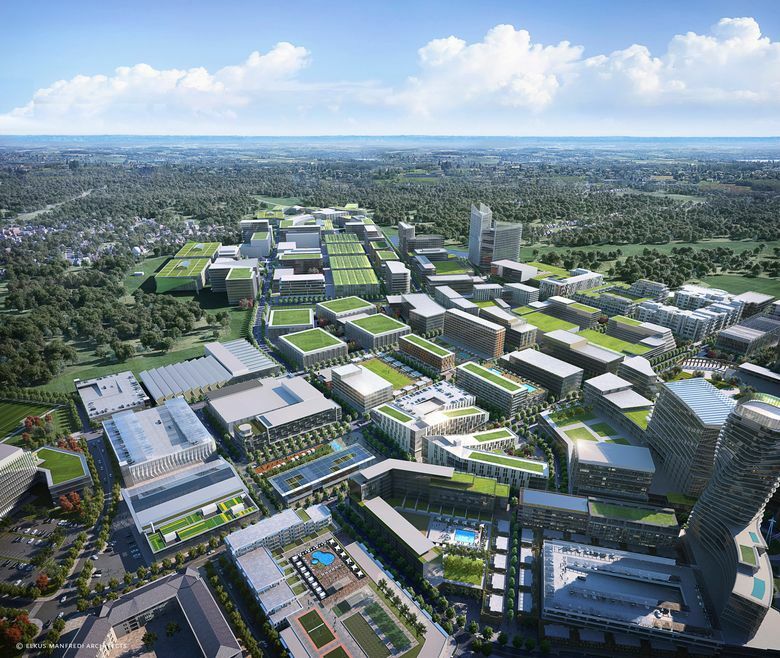 Plans include thousands of housing units and millions of square feet of high-tech commercial space on about 1,500 acres that extends into the neighboring towns of Rockland and Abington. 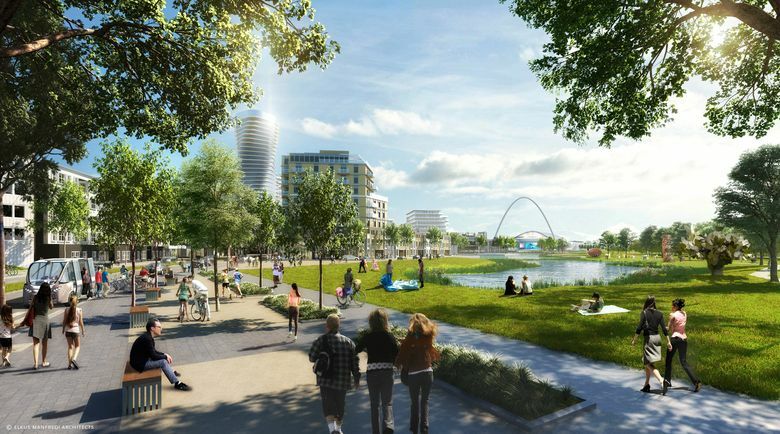 The community’s glass towers, public plazas, clustered housing, scattered parks and retail zones will be contained within 500 acres, leaving the rest as dedicated open space. So far, the community consists of about 1,200 occupied single-family homes, town houses and apartments, as well as a nearly completed $28 million sports complex with a miniature replica of Fenway Park. A cavernous aircraft hangar will be renovated as the centerpiece for a downtown district with shops, restaurants and open spaces with public programming. General Electric will use Union Point as a laboratory for testing new products and as a showroom for working systems. Eric Gebhardt, the strategic technology officer at GE Power, said the community’s energy plan will include microgrid technology, renewable generation and power storage. The company will also install “intelligent” lighting — streetlights with sensors that can track sound, light and other conditions. The data can be used to monitor traffic, help drivers find parking spaces and alert law enforcement if a gun is fired. GE has piloted some of its smart products in existing cities, but Union Point is an unusual opportunity because most of the infrastructure does not exist yet and the developer is open to experimentation, Gebhardt said. The Massachusetts Institute of Technology plans to open an innovation center in the air station’s old power plant. The center will house an interactive planning tool called CityScope, which will aid in Union Point’s evolution by allowing users to visualize and explore trade-offs around factors like density, transportation and walkability, said David Rose, a researcher and lecturer at MIT’s Media Lab. “We want the center to be a showcase for what the city could be, a place to monitor what it is becoming, and a place to ask existential questions like, ‘Could it be more inclusive, say, or energy efficient?’ ” Rose said. LStar also has an agreement with Optimus Ride, an autonomous-vehicle startup in Boston, to set up a self-driving vehicle service at Union Point. The company is already testing its electric vehicles at the property. Union Point’s first commercial tenant is expected this spring, when Prodrive Technologies, a Dutch company that develops and manufactures products for the automotive, medical and other industries, will break ground on its 60,000-square-foot United States headquarters. 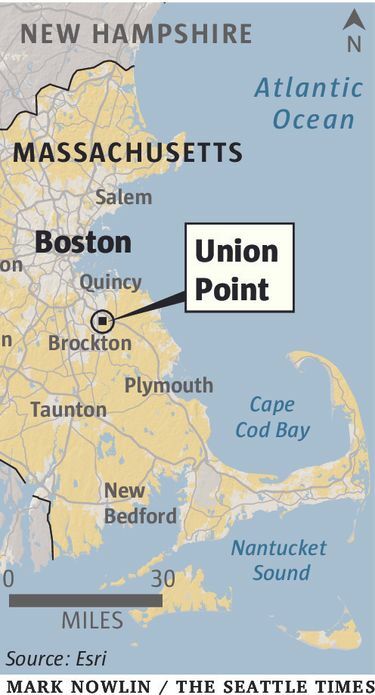 The site’s proximity to Boston, access to commuter rail service and ample room for expansion were crucial to the firm’s location decision, said Roy Willems, the company’s general manager of U.S. operations. He said Prodrive expected to build a second 200,000-square-foot building within three years, and increase its workforce to roughly 300 people. LStar had to persuade the three host communities to approve critical zoning changes before it could move forward with the project. They also granted the developer considerable latitude over the design and layout of the community, which will take shape over 15 to 20 years. 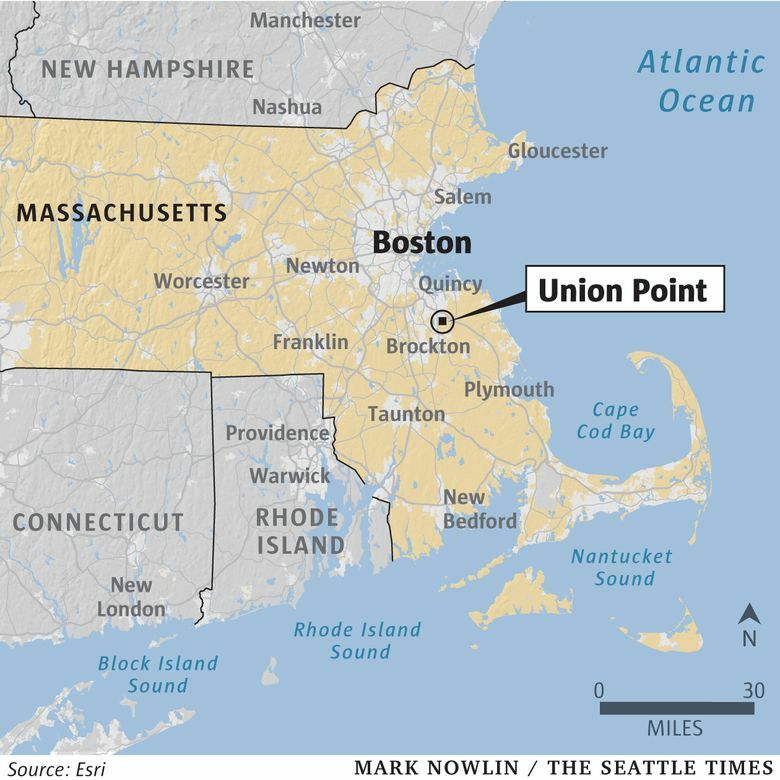 Union Point promises to bring sorely needed tax revenue to Weymouth, said the town’s mayor, Robert L. Hedlund. “It’s the commercial build-out that we’re lusting after,” he said. Still, similarly ambitious smart-city projects have proved perilous. Rose cited Songdo, a smart city nearing completion in South Korea, as a prime example. The city boasts advanced connectivity, but it has so far failed to meet expectations in attracting international businesses and residents. The integration of technology into urban planning has prompted questions about how the data being collected will be used. 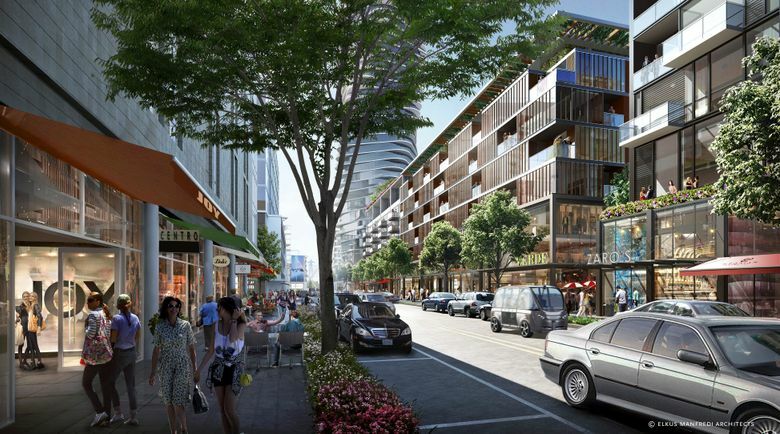 In Toronto, for example, Sidewalk Labs, a subsidiary of Alphabet, the parent company of Google, attracted considerable publicity when it was selected last year to help create a smart neighborhood of sorts in a waterfront district called Quayside. Some local officials and critics are questioning whether the deal gives too much authority to Sidewalk Labs without putting limitations on Google’s collection and use of data. The need for greater regulation of driverless vehicles has also come up for debate after the death last month of a woman who was struck by one of Uber’s self-driving cars in Tempe, Arizona. Corkum said retaining ownership of the roads would enable them to play with designs for amenities like drop-off areas for driverless shuttles and heated sidewalks. “It’s better for us to stay in this testing phase until we have good workable solutions,” he said. State oversight of autonomous vehicles only applies once there is public use, he said. Even then, the rules are vague. Ryan Chin, the chief executive of Optimus Ride, said his company would adhere to the same high-level safety standards and testing protocols at Union Point that they have followed for testing driverless cars in Boston’s Seaport neighborhood. The company is working with law firms and consultants on operating guidelines for gathering data and ensuring it cannot be hacked or used to invade privacy, he said.